Back with a brand new concept, WJSN wishes to work some magic as it tries to encourage fans to achieve their dreams. The 13-member girl band dropped its fourth EP “Dream Your Dream” on Tuesday. A few hours before the release, the band held a media showcase at Gwangjin-gu in eastern Seoul. With the title song “Dreams Come True,” the EP contains six songs in total --“Love O’clock,” “Renaissance,” “Starry Moment,” “Thawing” and a Chinese version of the title track. The music video of the track has a heavy filter effect. 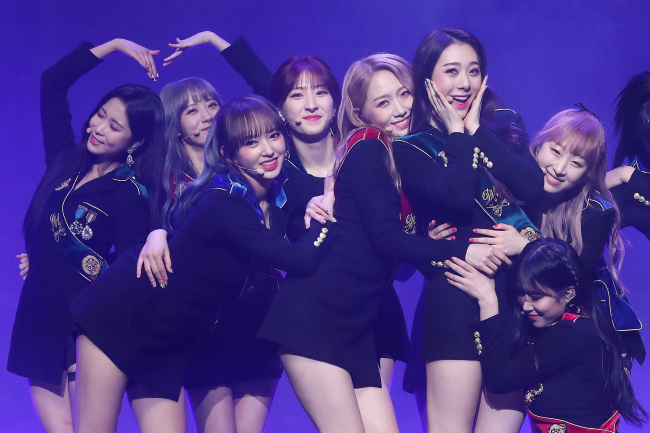 WJSN emphasized that the idea of hope and future are often associated with the color blue. The clip bears a striking resemblance to the hit Japanese animation film “Your Name.” The story of meeting someone on a train or a pedestrian overpass reminds many viewers of the film. Even the font for the title is the same. For the new EP, the members took on a new concept. They are presented as students at a wizard school who work on making dreams come true, separated into three sub-units by their grades. The first year students deliver dreams, the second years collect them and the third years make the dreams into reality. At the showcase, WJSN donned school uniform-style costumes with colored sashes to differentiate the grades. The Korean-Chinese girl group, which has three Chinese members, is jointly managed by Starship Entertainment and Yuehua Entertainment.